If you’re a big brand, you’re likely already active on Twitter - and with good reason. Twitter provides a platform for brands to have meaningful conversations with consumers, and ensure their messages get heard. In fact, 50% of Twitter users follow brands, and the platform drives twice the brand favorability of the same ads on TV. But a successful Twitter presence takes more than just a library of pre-written one-liners. Here are a few lessons you can learn from some notable brands who are seeing success via tweet. The beloved big box store implements many of the standard best practices for Twitter - the brand retweets customers going on Target runs, utilizes hashtags (including trending ones), runs polls, posts GIFs, and engages with its customers. Lately, the brand has been pushing its #TargetRun campaign, which encourages shoppers to tweet about their trips. By sharing in the joy of their shopping experience, and communicating with their audience around this, Target creates more hype around the campaign, and encourages more user-generated content based on their 'run' images. The tech giant is known for its unique marketing approach, and the way it uses Twitter certainly makes it stand out. Go to Apple’s Twitter profile, and you’ll see a profile pic, a cover photo… and that’s it. 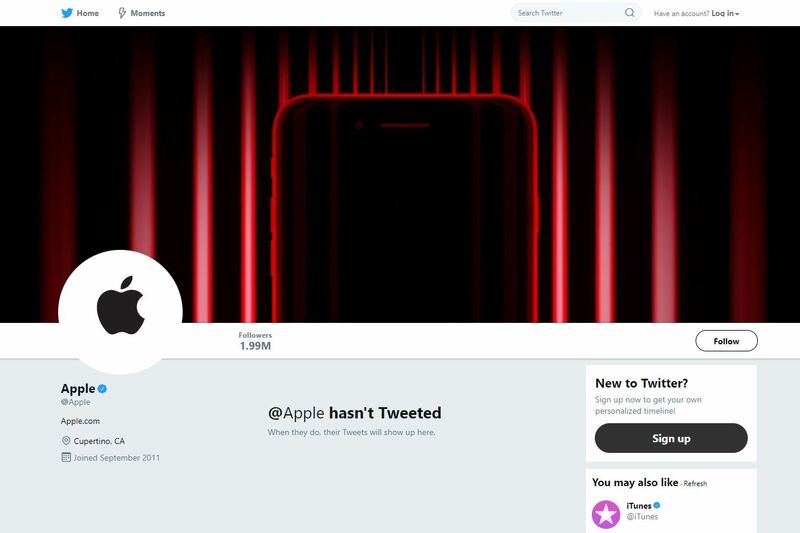 You’re greeted with “@Apple hasn’t Tweeted” message, yet the account is verified. Apple does two unique things on Twitter. First, it runs everything dark with promoted tweets. Carefully curated and targeted, videos will appear in users’ timelines during and after product announcements and launches. This may be a little different now with Twitter's new ad transparency tools, but what it means is that Apple does tweet, just not on its profile, and not organically. Second, it runs several branded Twitter accounts, including those for iTunes, Apple Music and The App Store. Doing this means the main @Apple account can remain mysterious and exclusive - right in line with the Apple brand. Through a lack of tweets, in difference to most other big brands, Apple is able to generate interest, while also cutting out the noise and any negative conversation, allowing its products and channels to clearly deliver the messaging it wants to convey. And while not every brand can follow the same template - if any - it does show that there's more than one way to approach Twitter. Being different can be just as effective, when done well. As Uber’s biggest competitor, Lyft positions itself as socially responsible, and tuned into the communities it serves. The campaign is topical, based on a major trending issue, and as you can see from the retweet count, has already gained significant traction. Lyft's campaign underlines the need to be aware of relevant news issues, and considering how they can relate to your business. And while it may cost Lyft some to offer significant discounts, that loss will likely be offset by the brand benefits of the press coverage gleaned by the campaign. Starbucks, of course, is already famous for its social media excellence, and its Twitter presence is no exception. But aside from the main Starbucks account, the coffee giant also runs another profile dedicated to its news updates. Starbucks isn't just known for its products, but also its commitment to quality, customers, and communities. The brand’s @Starbucksnews account enables it to share such stories, and update its customers and investors of its various initiatives and announcements. By creating a separate stream for such updates, Starbucks makes it easier for its audience to tune into relevant upates, while also providing a channel for Starbucks to get the word out, separate from the conversations on its main channel. Twitter can also serve just as well for B2B companies. Forrester, the market research company, leverages its Twitter account to showcase its solution-centered products and its connection to technology. One of Forrester's more successful content series' focuses on sharing a range of relevant quotes from thought leaders in the tech space. The approach underlines the value of working with experts, and using their insights to help support your campaigns. It's a simple, yet effective way to boost interest, and reinforce your business knowledge and expertise. As you can see, there's more than one way to approach Twitter, and thinking outside the box can have significant benefits, when done right. Some of these approaches are well-known and utilized, others less so - but the important note is that you need to consider the various ways in which people use the platform, and how you can use that to advantage.